May 17, 2017 -- Today, the City of Houston announced two new additions to the City of Houston Art Collection at the Mickey Leland International Terminal ticketing area of George Bush Intercontinental Airport. Travelers to Houston Airport System’s Mickey Leland International Terminal (Terminal D) are now welcomed by a kaleidoscopic multi-media double mural by Jay Shinn, marking the internationally acclaimed artist’s second commission to join the City of Houston Art Collection. Titled Celestial Candyland (15’ x 150’) and Candyland Landing (15’ x 45’), these site-specific works combine two-dimensional geometric patterns on the wall superimposed with a slow tempo of choreographed, color-changing pattern projections. The resulting “moiré effect” is a visual perception that occurs from the offset patterns, producing interesting and beautiful illusions from the shifting layers. Shinn took inspiration from the sky in designing the artwork’s dissolving color changes to evoke peacefulness, meditative wonder and calm.The artworks are located in the ticketing area of the terminal. An artist with an international profile, Shinn has explored minimal geometric abstraction through a variety of mediums including light-based forms such as projection and neon. His most recent investigations address variations of form through the use of slightly altered light with elements of physical illusions. His work is exhibited throughout the United States and internationally and is in numerous private and public collections in the U.S. and Europe. The City Art Collection previously acquired three neon works by the artist at Houston Hobby Airport. 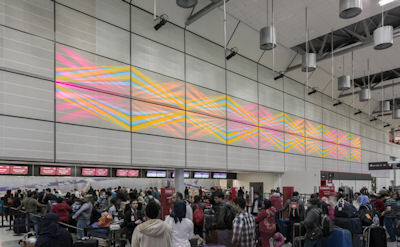 Conception to installation was a two year process and the artist worked closely with Houston Airport System and Houston Arts Alliance, which is under contract to manage Civic Art projects for the City. The artwork is funded by the City of Houston Civic Art Program. In 1999, the City of Houston established an ordinance mandating that 1.75% of qualified Capital Improvement Project dollars be set aside for civic art. The program is managed by the Mayor's Office of Cultural Affairs. For more information about the City’s Cultural Programs go to or www.houstontx.gov/culturalaffairs follow the Mayor’s office of Cultural Affairs on Facebook @HoustonMOCA.